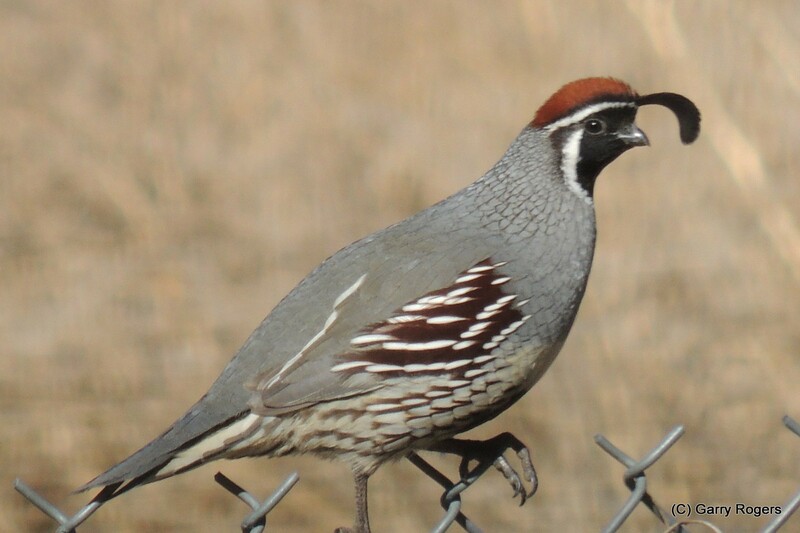 Gambel’s Quail live in D-H’s chaparral-covered hills. They form coveys of 12 or more birds that roost and nest in shrub thickets. Once, a family of mom, dad, and a line of seven chicks dashed across the road in front of my car. I stopped, and just as the last of the chicks made it to safety, another chick entered the road far behind the others. Dad popped onto road, ran back, and pecked the slowpoke’s fluffy bottom, speeding its dash to catch up. The first covey to move into my place near the center of town came in 2014. The birds roost in a woodpile I made with dead shrub and tree branches. Quail are too plump for standard feeder perches, so be sure to scatter a few seeds for them when you fill the feeder. Quail lives are short, usually less than 4 years. Nest: Grass and twigs on the ground in shrub thickets.